Artificial Intelligence helps choose what books you buy, what movies you see, and even who you date. It’s in your smart phone, your car, and it has the run of your house. It makes most of the trades on Wall Street, and controls our transportation, energy, and water infrastructure. Artificial Intelligence is for the 21st century what electricity was for the 20th and steam power for the 19th. But there’s one critical difference — electricity and steam will never outthink you. The Hollywood cliché that artificial intelligence will take over the world could soon become scientific reality as AI matches then surpasses human intelligence. Each year AI’s cognitive speed and power doubles — ours does not. Corporations and government agencies are pouring billions into achieving AI’s Holy Grail — human-level intelligence. Scientists argue that AI that advanced will have survival drives much like our own. Can we share the planet with it and survive? Our Final Invention explores how the pursuit of Artificial Intelligence challenges our existence with machines that won’t love us or hate us, but whose indifference could spell our doom. Until now, intelligence has been constrained by the physical limits of its human hosts. What will happen when the brakes come off the most powerful force in the universe? 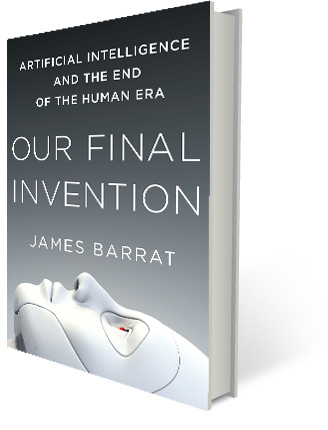 Copyright © 2019 James Barrat - Our Final Invention: Artificial Intelligence and the End of the Human Era.